Timber has been a popular building material since time immemorial, but with recent shock and concern over global deforestation – 13 million hectares lost per year! – many people are questioning whether they should be using it. The quick answer is yes – as long as it’s from a sustainable source! Here’s 13 reasons why it’s the best construction material. Through photosynthesis, trees absorb carbon. In an undisturbed forest, old trees eventually die and as they decompose most of their stored carbon is released to the air (apart from a little that remains in leaf-litter and topsoil) – making an almost neutral impact on atmospheric carbon over their life. Most people assume that cutting trees down for use in construction will be bad for the environment and climate because less trees will be around to absorb carbon from the air. This is absolutely right – if you’re talking about ‘conventional’ (destructive) logging. However, with sustainable forestry, at least as many new trees are grown than are harvested. As long as a timber product does not burn or rot, its carbon stays ‘locked up’. So, when trees are harvested, their carbon is stored in timber, and they are replaced by new young trees, the net effect is removing carbon from the atmosphere – which is good for the climate. Around a tonne of carbon is stored in every metre cubed of timber. Even better, trees actually absorb carbon very rapidly while they are growing, and absorb less as they age. This means that sustainably managed forests where trees are harvested and replaced can potentially be an even more effective carbon store than an undisturbed forest. Timber has the lowest embodied energy (energy used in its processing, production and transport, from tree to consumer use) of any mainstream building material, and far less than for steel, concrete or aluminium. This is mainly because timber requires only minimal processing compared to other materials. As the embodied carbon in the average building accounts for 30-50% of its whole carbon footprint, this has the potential to make a huge impact. Its processing also emits less sulphur dioxide, carbon monoxide, hydrocarbons, particulate matter and VOCs than competing materials. Looking to the longer term, one of the biggest advantages of timber is that it is obviously a naturally renewable material. A tree can be grown to a suitable harvest size in 25 to 80 years, while the raw materials for bricks, steel and plastics are only renewed over geological time – i.e finite in human terms. Timber is a highly durable material. Some well-made wooden structures last for centuries, such as the timber frames of many Tudor buildings. It is also easy and cheap to maintain compared to other materials, especially if you don’t mind it changing its colour over time. It is also a very strong material with good structural properties, being suitable for up to eight storey buildings (and new innovations are now even allowing timber to be used for high-rises!) It also has good fire resistance. This could be surprising considering its use as a fuel, but it burns in a much more predictable way than steel – which dramatically collapses after a ‘flash point’ is reached. Wood is a universally popular material that is widely agreed to offer a warm and comforting aesthetic. As a natural material, it also has the benefit of helping a structure to blend in with its landscape, especially in rural areas. This gentle visual impact can sometimes help projects get planning approval in sensitive sites. As well as being naturally beautiful, wood is also extremely versatile. Different species of tree produce timber of differing colours, textures and functional qualities. Wood also competes with plastic in its enormously wide range of applications: from structural frames to exterior cladding and joinery, and from decorative finishes to furniture. Timber-framed buildings are far quicker to erect than brick or stone buildings. A quicker build time clearly saves time and money for both domestic and commercial property owners. Building with timber is also a less specialised and expensive skill – carpenters are typically more affordable than other skilled trades such as bricklayers. A timber frame allows more space for insulation than a brick building, and wood itself also has naturally thermally insulating properties. Of course, a better insulated home requires less energy to heat and cool, which typically means less fossil fuel use (and also costs the occupiers less, being particularly beneficial to those on low incomes). This acts as an indirect reduction of carbon emissions, in addition to the carbon capture and storage of the timber itself and the emissions saved from replacing other more energy intensive materials. 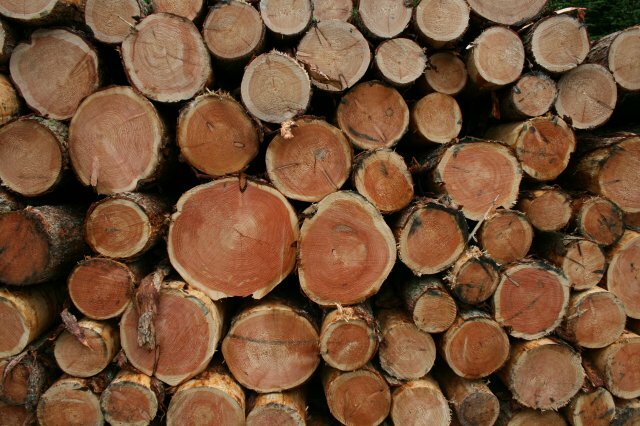 While only 35-45% of a log is suitable for large pieces of sawn timber, the versatility of the material means the other wood can be used for a wide range of lower value products such as small wooden products, fencing, fibreboard, OSB, wood fuel or even sawdust for animals. For example, Sussex now has a finger-jointing machine which reconstitutes small pieces of wood into larger pieces with non-toxic glues. Timber can also be salvaged from demolished buildings and reused – keeping its stored carbon locked up for even longer. To be fair this rarely happens in practice, although the potential is there. If no other use is feasible, wood can be safely composted or burnt as fuel. Burning wood is not always ideal as it releases its stored carbon into the atmosphere. However it is carbon neutral because the emitted carbon is equal to what the living tree originally absorbed, and if the wood fuel is used in place of fossil fuels, the net effect is good for the climate. Although wood can be treated with toxic preservatives which can off-gas and prevent the wood from being safely burnt or composted, this is not strictly necessary and in its natural state wood is completely non-toxic. With careful specification of durable timber, wood can often be used untreated. Also advances in green chemistry mean more non-toxic glues and preservatives are being developed all the time. Even ‘conventional’ chemicals have been improved in recent years so off-gassing is now minimal. As an organic material, wood is a natural humidity regulator which absorbs or releases moisture according to how humid or dry the environment is. This can have a subtle beneficial effect on internal air quality and health. Forests are incredible and priceless habitats for wildlife – including many endangered species. Demand for sustainable timber means demand for well managed sustainable forests – meaning more forest habitat for the vast number of species that call them home. The Rainforest Alliance says that sustainability certifications for managed forests always promote biodiversity-friendly practices, and obviously don’t allow the wanton destruction of ‘conventional’ logging, yet cannot be expected to be as good for wildlife as undisturbed forest. However researchers from Yale University say that because different types of forested landscape – like savannah, woodland clearings, under-storey, dense forest and complex multi-storey forest – support different species, all these types should be encouraged for optimum biodiversity. Dense forest – although necessary for many species – is actually not the most biodiverse type. The researchers argue that sustainably managed forests could potentially be better for wildlife than leaving tiny pockets of fragmented forest undisturbed – by ensuring a balance of landscape types and linking them with wildlife corridors – whilst using the ‘thinning’ process to produce timber products. Most forests are not currently managed in this way, but the potential is there. Forests are also beautiful spaces for nature-based recreation for people too. If accessible to the public, managed forests could also provide this leisure and wellbeing benefit. Lastly, forests (and all trees) also provide several other ecological services beside helping to combat climate change and being wildlife havens. They reduce the risk of flooding, drought and soil erosion. They help stabilise and regulate weather and micro-climates. And they purify the air by producing oxygen and absorbing carbon dioxide along with other air pollution. These benefits mean increasing forest cover is great for helping us adapt to the climate change already ensured, as well as mitigating its root cause. Like number 12, choosing sustainable timber for construction means more commercial demand for sustainably managed forests – and the more economically valuable they are, the more there will be. So there you go. We hope you’ll now agree that timber is naturally fantastic – with numerous environmental, functional and aesthetic benefits. Which is why we use it in almost all our projects. But most of these benefits only apply to sustainable timber – and buying from destructive logging operations is extremely bad for the climate, endangered species and forest communities. So how to ensure you’re getting the good stuff? The best way is to choose locally grown and/or certified timber. If it has been grown in the UK or elsewhere in Europe, you probably don’t need to worry. When buying from further afield, or if you want peace of mind, always choose certified timber. There are many different ‘alphabet soup’ certifications, including FSC, PEFC, SFI, CSA and MTCC. Both WWF and Greenpeace back FSC as the most credible and strict certification, and it’s the one we trust the most too. (Here’s a map of all the FSC certified forests in the UK). It’s generally best to avoid tropical hardwoods, especially mahogany – which is almost never grown sustainably. Only 10% of timber coming from rainforests is certified, while as much as 90% of timber used in the UK is certified. We try to source our timber locally whenever possible, as this reduces emissions from transport and contributes to the local economy. The South East of England is actually the second most wooded part of the UK, after Scotland. So – next time you’re considering an extension, refurbishment or larger design project, make sustainable timber your material of choice.